Posted on 26. February 2016. 26. February 2016. by Claire H.
This book purchase was a really unusual one for me. I don’t usually read film novelisations because I usually presume that they will be little more than a poor attempt to promote the film and I therefore never have very high expectations for them. 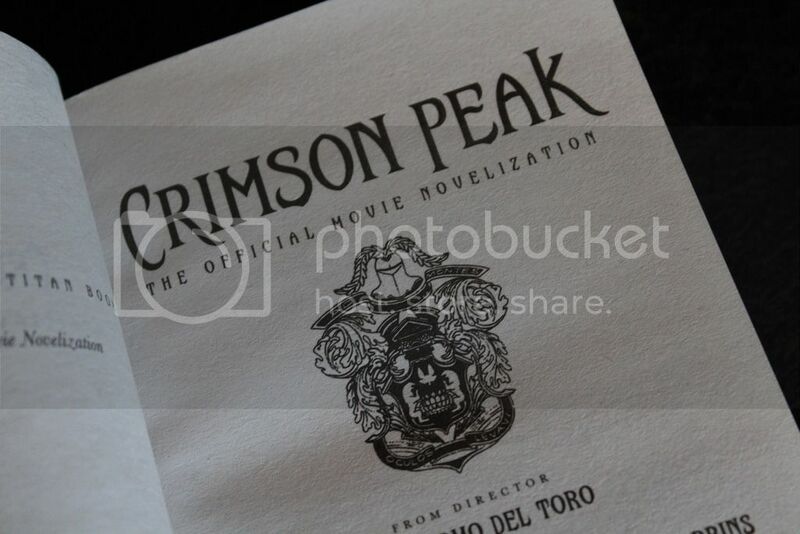 However, I saw the novelisation of Crimson Peak for sale a few weeks ago for a very reasonable price and I couldn’t resist it. I still have not seen the film as I’m waiting to buy it on DVD (buying the DVD is surprisingly cheaper than going to the cinema for me) and so I will not be able to compare the novelisation to the film. However, I think having only read the book will be advantage in this case, as I did not have any previous preconceptions regarding the plot, and I can therefore consider the book as a standalone piece. I must admit that I spent the first ten minutes after purchasing this book admiring it. It is surprisingly beautiful. The cover is a shot of the film, which is disappointing as I think the reader ought to be able to allow their imagination to decide what the characters ought to look like instead of being influenced by the cover, but I do understand that it is necessary to link it to the film. 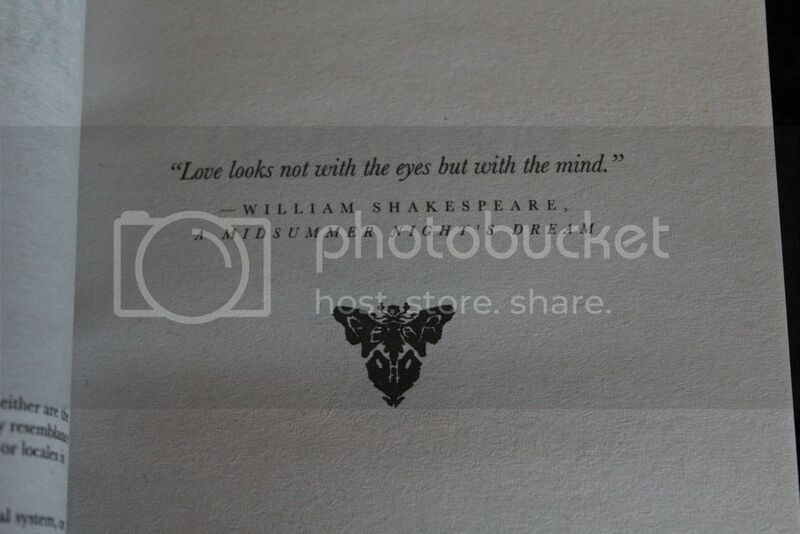 However, the inside of this book is wonderful. 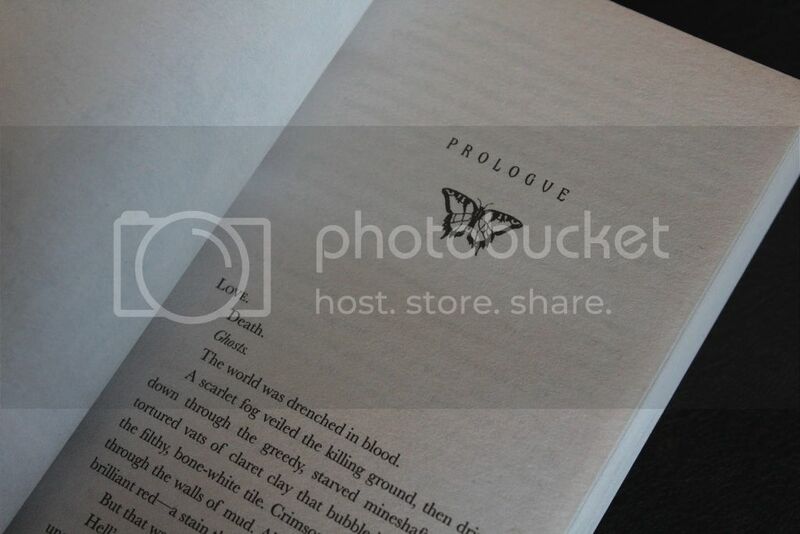 The pages are decorated with butterflies, and the font complements the plot very well. The drawing of Allerdale Hall at the beginning of the novel is also worthy of note, but my favourite details are the small butterflies above each chapter. 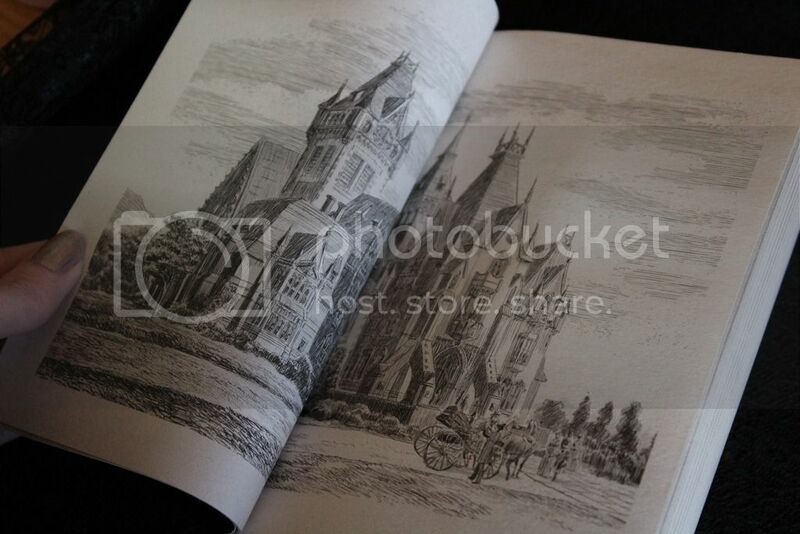 The art on the inside of the novel adds to be the atmosphere of faded opulence, which is further reflected in Holder’s description of Allerdale Hall in the narrative. The plot is not remarkably unique but the novel retains its pace despite its predictability. I found myself still turning the pages without regard for the unsurprising nature of the narrative. I found myself swept up into the story from the first pages. If I read this prior to hearing about the film release, I think I would have presumed that it was a standalone novel. Holder writes eloquently and beautifully, and the plot was compelling. Likewise, the characters were interesting and dynamic. I adore villains that are more than a role. I often find that villains are often just created as an opposition to motivate the plot and lack a personality of their own, but the villains of Crimson Peak were not simply black and white, but laced with shades of grey. I found them to be both sympathetic and unnerving simultaneously. This is one of the main elements I look for in villains and it was executed beautifully. The use of flashbacks woven into the narrative complemented the plot and enriched the characters wonderfully. Furthermore, I thought the descriptions of the ghosts were excellent. I am usually more disconcerted by descriptions of ghosts in literature than of ghosts depicted on screen. I find that your imagination often frightens you more than the visual, and I imagine that this may be the case with Crimson Peak. I haven’t seen the film rendition, but I found the ghosts in the novel beautifully described. ‘From the floor, pulling itself out, a spectre of purest scarlet, a grotesque revenant, emerged painfully, struggling, sucking its essence through the floor: the spine first, like taffy, then the back of the head while an arm withdrew as from a vicious, sticky sludge. Bright red bones stretched in unnatural shapes, weirdly, wrongly jointed; the hand slapped down as if for leverage, purchase.’ I found this a peculiar but intriguing image. The ghosts did feel a little ornamental at times, but passages like this are so beautifully written that I did not mind that they were not overly necessary to drive the plot. My only criticism is that the narrative voice did not really change when switching to a different point of view. Edith’s voice was very similar to the other characters and a little more distinction between the characters voicing the narrative would have been interesting. The only exception was the ghost point of view, which was intriguing and added interest to the plot. I also wasn’t overly attached to Edith as a character. I found Lucille Sharpe to be much more dynamic and appealing. I’m not overly sure about what it is that I do not like about Edith. I think I found her a little fickle and too naïve. Her only interesting trait seemed to be that she believed in ghosts, and I didn’t feel that this was enough to make the character interesting for me. Overall, I am pleasantly surprised by this novelisation. The plot echoes numerous other literary works, but the atmosphere of the novel most distinctly resembles the traditional Bluebeard story, but with elements that are a little more reminiscent of Angela Carter’s rendition of Bluebeard, The Bloody Chamber. It is incredibly well written, fast paced and whilst it is lacking in originality, it remains a captivating read. I purchased the novel in paperback, and I would adore a hardback edition too. It is definitely worth a read and I regret my previous decision to disregard novelisations as inferior and lacking in quality. I thoroughly enjoyed Nancy Holder’s rendition of this story, and look forward to watching the film accompaniment.